Wednesday night reached a low of 37 F --- dangerously close to the frost. We're not ready to light our first fire, so it took a while for us to emerge from our nightly cocoons. When I did get up, Strider was unusually affectionate, nestling down beside me as I read my morning blogs, and even Lucy didn't seem quite so keen on uncurling herself before her morning walk. The great thing about sudden cold weather, though, is wildlife. "Cold-blooded" animals aren't ready to hibernate yet, but the chilly temperatures make them slow down. While weeding, I got a great shot of a tiny Pickerel Frog. 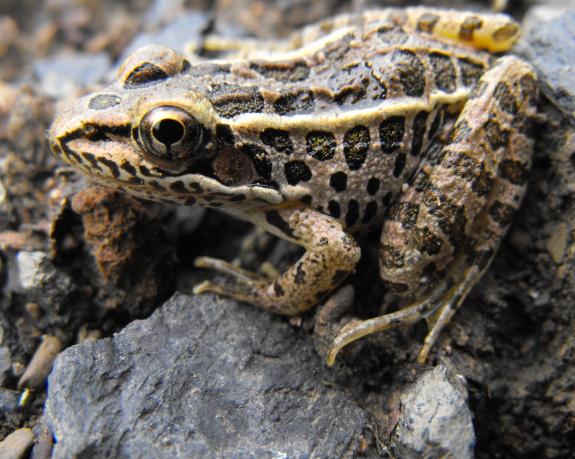 Usually, Pickerel Frogs are the fastest amphibians on our farm, pushing off with those long hind legs and disappearing before my mind even registers "frog." But not today! Take advantage of the fall slow down to make a homemade chicken waterer.